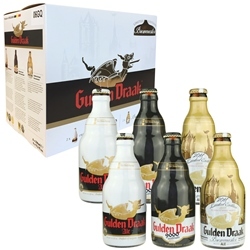 The Gulden Draak Sampler includes six 11.2 oz bottles of Gulden Draak ale from the Van Steenberge Brewery. Set includes two each of the following ales: Gulden Draak, Gulden Draak 9000, & Gulden Draak Brewmaster Reserve 2017 Limited Edition. 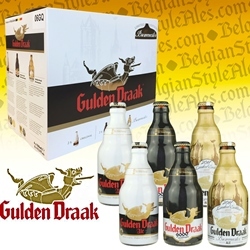 Gulden Draak (Golden Dragon in English) is a Belgian Strong Ale that pours dark red-brown with a foamy pale tan head. Named for a 900 year old gilded dragon statue that sits atop the clock tower of the Ghent town square, the brew is top fermented and bottle conditioned. Aromas include dark fruits, toffee, bread and banana with notes of alcohol, bubblegum, candied cherry and coffee. Taste follows the nose and also includes sweet malt with notes of chocolate and some hop bitterness. The mouthfeel is full bodied and smooth with a lively carbonation; the 10.5% ABV is present but not at all overpowering; and the finish is long and bittersweet. Gulden Draak 9000 is a traditional abbey Quadruple that pours a deep amber color with a foamy white head. A companion to the original Gulden Draak, this updated recipe includes three different varieties of malt at four times the content of a standard lager. Aromas include rich caramel, dark fruits, raisins, dates, alcohol, bread, apple and pear. Taste follows the nose and also includes notes of bubblegum, wood, apricot, toffee, clove and pepper. The mouthfeel is medium bodied with a lively effervescence; the 10.7% ABV is a definite presence but not at all overpowering; the finish is warm and dry. Brewmaster Jef Versele crafted exclusive Gulden Draak Brewmaster Reserve (2017 Limited Edition) (ABV 10.5%) as a tribute to his grandfather Jozef Van Steenberge and the 230th birthday of the brewery. Inspired by his numerous trips to the USA and his respect for the craft beer culture, the beer is matured in whiskey barrels, which lend flavor both from the oak and from the former contents. Pours hazy bronze with aromas of banana bread, toffee, whiskey, and fudge. Taste follows suit, with a lush mouthfeel and some dryness in the finish. 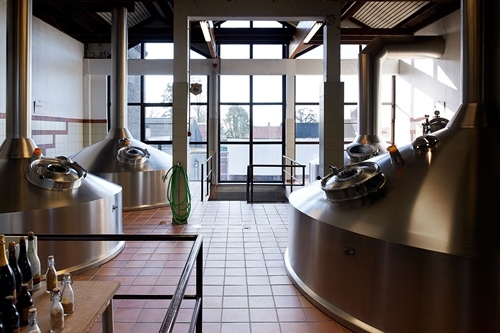 Located in Ertvelde, a village in the East Flanders region of Belgium, the Van Steenberge Brewery began in 1784 as a farm brewery (like many hundreds of others in the region) selling beer to local cafes and pubs. The brewcraft evident in the ales produced resulted in increasing demand; over time, beer revenue significantly outpaced farming revenue, allowing the Van Steenberge heirs to concentrate fully on the brew business. 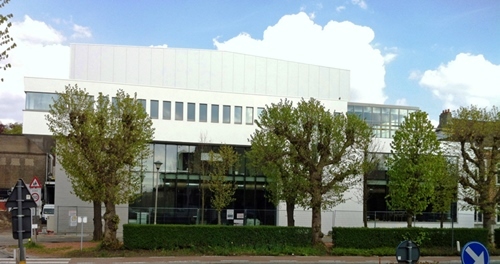 Today, still family-owned in the sixth generation, the Van Steenberge Brewery distributes award winning ales to more than a dozen countries including Italy, Spain, and the United States.